Ocean Technologies’ EDM Drills are high-quality machines and are competitively priced. The full line of models range from simple-to-use manual machines to fully programmable 5-axis machines capable of machining complex aerospace parts. Ocean Technologies EDM Drills have patented technologies for break-thru detection, and a proprietary HP1+ Power Supply for significantly reduced wear and shorter burn times while reducing energy consumption. The compact, entry-level River 300 features high-efficiency linear guideways and a 100L DI/Filter comes standard. The X-axis travel measures 11.8″ (300 mm), Y-axis at 7.9″ (200 mm), Z-axis at 11.8″ (300 mm) and W-axis at 13.8″ (350 mm). Table dimensions are 13.8″ x 9.9″ (350 x 250 mm). Maximum workpiece height is 11.8″ (300 mm) with maximum workpiece weight capacity at 330 lbs (150 kg). E-Learning software is featured on the River 300, as well as on all Ocean CNC Models, allowing new operators to easily run the machine or seasoned operators to review particular processes on the fly. 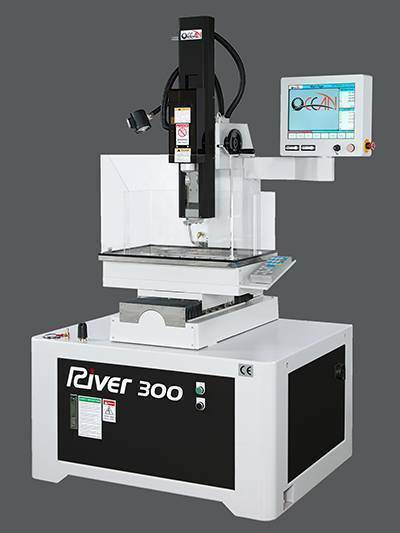 Demonstrations at IMTS will include multi-cavity programmable drilling on the River 300. Ocean Technologies EDM Drills will also show the high-speed, low wear burning of holes in 4″ tall Inconel rods and in 1″ thick steel plates, as well as an A/ B axis tilt/ turn table demonstrating break-thru detection and the reliable Ocean Technologies’ electrode changer.